WILLIAMSPORT – Junior pitcher/outfielder Holly Lansberry of Curwensville tied a 16-year-old Lycoming record by extending her hitting streak to 17 games last week and then was named the school’s female Athlete of the Week for the second time this season after going 10-for-20 at the plate and pitching a shutout. The Warrior leadoff batter ‘s streak, which matched the standard set by Amy Long in 1996, began on March 25 and included nine multi-hit games as her average soared from .231 to .400 before she went 0-for-3 with a walk in the nightcap of Saturday’s Commonwealth Conference doubleheader against Widener at Chester. Lansberry began the week with a 5-for-6 effort in a twinbill split against conference rival Wilkes at Edwardsville April 16. In the opener, she smacked three hits, one a double, walked once, drove in a run and scored once, but she wound up the losing pitcher when the Colonels broke a 4-4 tie with a two-out run in the bottom of the eighth inning. Lansberry have up only six hits and three earned runs while striking out eight, walking two and hitting one. She singled and scored in the first inning and made it 3-0 with a sacrifice fly in the second frame as the Warriors won the second game 4-1. Lycoming traded shutouts with non-conference foe Elmira (N.Y.) Wednesday, and Lansberry singled twice and spun a four-hitter with six strikeouts and no walks in the 5-0 first-game victory. Her single was one of only five Warrior hits in a 6-0 loss. Lansberry tied the hitting streak record with two singles but was saddled with the 4-2 loss in the first game against Widener Saturday. She permitted just four hits and three earned runs. She posted three strikeouts, four walks and two hit batsmen. Lansberry leads the Warriors with 34 hits, a .386 batting average that ranks No. 11 in the conference and a .439 on-base average. She has five doubles, nine RBIs and 15 runs scored. Also, she has four stolen bases in five attempts. In the circle, Lansberry (4-9) has worked 75.1 innings with 55 strikeouts, third most in the conference, 30 walks and seven hit batsmen. She has allowed 91 hits and 54 runs, 40 earned, in 13 appearances with 12 starts and eight complete games. 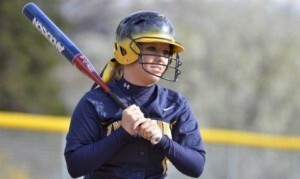 CLARION – Freshman outfielder Sara Clark of Curwensville ended her rookie season for Clarion (8-32) with 29 hits and a .254 batting average in 37 games, all but one as the starter in left or center or as the designated hitter. Clark, whose average was above .300 until early April, struggled down the stretch, as did her teammates. The Golden Eagles, who got off to a 6-3 start, lost their last 11 games, six by shutouts, including four last week when they were swept by Slippery Rock in a non-conference twinbill and then by Indiana and Bloomsburg to finish 0-16 in the Pennsylvania State Athletic Conference Central Division. Clark was 29-for-114 with a team-high two triples and three doubles. She drew six walks, which tied for second on the team, scored 11 runs and drove in 10. ERIE – Junior starting pitcher Mike Moyer of Clearfield chalked up his fourth win for Penn State Behrend (22-10-1) with a seven-inning stint that helped prevent Mount Union (23-9) from setting a school record for wins at Alliance, Ohio, last Wednesday. The unbeaten right-hander retired the first 11 Purple Raiders he faced before losing a shutout on three consecutive two-out singles in the fourth frame. Moyer, who struck out two and gave up 10 hits and two earned runs, departed with the Lions up 8-4, and Connor Semple wrapped up the 10-4 non-conference victory with two shutout innings. Sophomore Chad Zurat of Clearfield suffered a tough loss in his lone outing of the week when LaRoche (16-15) pushed across a run in the bottom of the 12th inning to nip the Lions 6-5 Sunday. The Redhawks (11-3) eked out a 4-3 win in the nightcap to replace the Lions (10-3-1) atop the Allegheny Mountain Collegiate Conference. Zurat relieved in the seventh after the Lions had blown leads of 4-0 and 5-2 and gave up two singles that loaded the bases before notching a strikeout and then grabbing a comebacker to start a double play to prevent a walk-off win by the Redhawks. The right-handed bullpen ace proceeded to blank LaRoche for four more innings his fourth walk was converted into the winning run via a two-out infield hit, only the third he allowed over the 5-2/3 innings. He struck out five. His six saves continue to top the AMCC, and he shares the lead in games in relief (13) and games finished (11). Zurat, whose 34 strikeouts are tied for seventh in the conference, is 1-2 with a 1.50 earned run average for 24 innings of work while yielding just 12 hits and nine walks. Moyer is tied for fourth in wins among AMCC starters and is tied for third in walks (9), fourth in runs allowed (18), fifth in earned runs allowed (14), sixth in ERA (3.35), ninth in opposition batting average (.289) and one of eight starters who have not surrendered a home run. He has logged 24 strikeouts in 37.2 innings. ALTOONA – Junior infielder Derek Danver of Clearfield continued his quality production as the No. 4 batter in the Penn State Altoona (14-20) lineup with five hits and five runs driven in last week. His RBI-singles gave the Lions 1-0 and 3-0 leads on their way to an 11-1 win over LaRoche after the visitors had taken the first game of the Allegheny Mountain Collegiate Conference doubleheader 6-4 on Tuesday. The split kept the Lions at .500 (7-7) for a fifth-place tie with Pitt-Bradford. Danver singled across a run in a 13-9 non-conference loss to Juniata at Huntingdon Thursday and had a two-run single and another hit in a 13-5 loss to Waynesburg Friday. Penn State Altoona rebounded with a 7-6 win in the non-conference twinbill. The 5-for-17 week left Danver with a .348 average that is third on the team and No. 19 in the AMCC. His 31 RBIS lead the Lions and are tied for seventh in the conference. Danver counts eight doubles among his 40 hits in 115 official at-bats and has scored 20 runs. BRADFORD – Sophomore outfielder/pitcher Sam Gardner of Curwensville stroked three hits and drove in three runs as Pitt-Bradford (14-17) pounded D’Youville (N.Y.) 11-3 and 19-1 Tuesday, April 17, to balance its Allegheny Mountain Collegiate Conference record at 7-7. He registered RBIs with a double, his first career extra base hit, and two walks in the opener and singled twice, stole a base and scored two runs in the second game. Gardner also received a walk that forced in a run and in Thursday’s 6-4 non-conference victory at Fredonia (N.Y.) State. In 16 games, including 10 starts, he is 11-for-35, a .314 average, with eight RBIs and eight runs. He als has three stolen bases. LEWISBURG – Penn State sophomore Gwenn Porter of Clearfield placed 11th among 12 runners in Section 2 of the 1,500-meter run with a time of 5:07.73 on the Christy Mathewson Memorial Stadium track at the Bucknell Team Challenge Saturday afternoon.